Un long métrage sur l’émergence de l’industrie du cinéma rwandais et un exemple concret de comment l’art guérit. A feature documentary about the beginning of Rwanda’s film industry, and a real life example of how art heals. 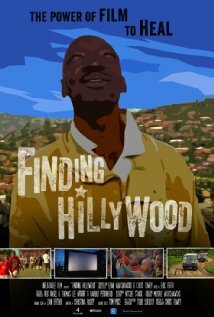 Hillywood, the Rwandan film industry, is given the spotlight in this affectionate portrait featuring the filmmaking community, the blossoming film festival culture, and the joy of the people as they experience Rwandan cinema on the big screen. In Hillywood (Rwanda’s film industry named for the country’s rolling hills) there is a blossoming film community. As Rwanda is still healing from the wounds of a cultural genocide almost 20 years ago, cinema has become a way for artists to express themselves and create cultural discussion. Finding Hillywood efficiently introduces the major players who set the beginning of the industry in motion. Eric Kabera founded the Kwetu Film Institute, directed the first Rwandan feature, and created the Rwanda Film Festival. Ayuub Kasasa Mago is a renaissance man within the industry, equally adept at directing, acting, scouting, or « fixing » just about anything a production might need. While it is easy to see that Eric is the heart of the industry, as the film continues Ayuub comes to represent its soul with his all-encompassing passion. Local Seattle filmmakers Leah Warshawski and Chris Towey have created a stirring documentary that functions as a Rwandan history lesson but also reveals the power of media as a catalyst for cultural healing. The film’s final act takes a breathtaking final turn as Hillywood connects the people of Rwanda with the goosebumps of seeing their culture represented on the biggest screen available.